Epson’s proven original ink tank system delivers reliable printing with unrivalled economy. At just RM 35.90 per bottle, Epson genuine ink bottles let you enjoy ultra-high page yields of up to 1,800 4R photos* at very low running costs. *Quoted yields are extrapolated based on Epson original methodology from the print simulation of Test Patterns provided in ISO/IEC 29103. Quoted yields are NOT based on ISO/IEC 29102. Actual yields may vary depending on manner of usage and print pattern. The integrated wireless connectivity on the L805 allows easy and flexible printing from your mobile devices over a wireless network. Epson iPrint - Print directly from your smart devices or online cloud storage devices. You can also use your smart device as a scanner to capture a document, format, enhance, and print it to a Wi-Fi-enabled printer wirelessly via the app. Epson Email Print - Print to any Email Print-enabled Epson printer from any devices or PC with email access. Remote Print Driver - Print to a compatible Epson printer anywhere in the world via the Internet, using a PC with Remote Print driver or from mobile devices via the Epson iPrint app. With a resolution of 5760 dpi and the expanded colour gamut of 6 inks, you can be assured of the highest quality in photo printing. With a photo print speed of up to 12 sec per 4R photo*, you can achieve much more with less time. *Based on 4R borderless photo draft mode. With the Epson L805, you can print directly onto the printable surface of your CDs/DVDs, removing the need for additional adhesive labels, thereby saving you money. 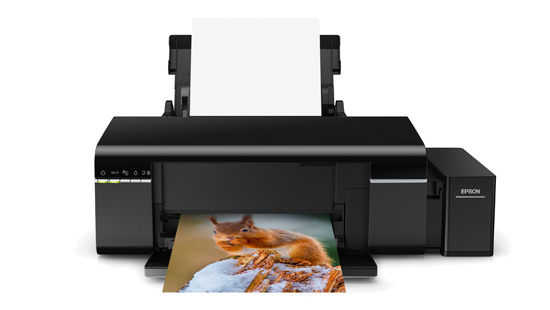 Achieve photo lab quality prints with Epson’s Easy Photo Print. The easyto- use software allows you to choose from fixed layouts for your photos or customise photo layouts based on your needs. You can also quickly perfect your photos with image correction features such as Red Eye Correction and Photo Enhance. Enjoy Epson’s warranty coverage of up to 1 year or 3,000 prints, whichever comes first, for maximum value from your printer. Epson’s warranty covers the printhead, which is most important for a printer designed for high volume printing.